Over the past year I have on a number of occasions been so fortunate to work for the World Health Organization’s Regional office for Europe (WHO/EURO) on various communication tasks related to Tuberculosis (TB). Although we in Europe tend to worry mostly about non-communicable diseases and many perceive infectious diseases as something we have pretty much under control, Tuberculosis is actually a big problem in many countries of the region. Especially the incidence of Multi-Drug Resistant TB (MDR-TB) and Extensively Drug Resistant TB (XDR-TB) is worrying – to me actually a bit frightening. 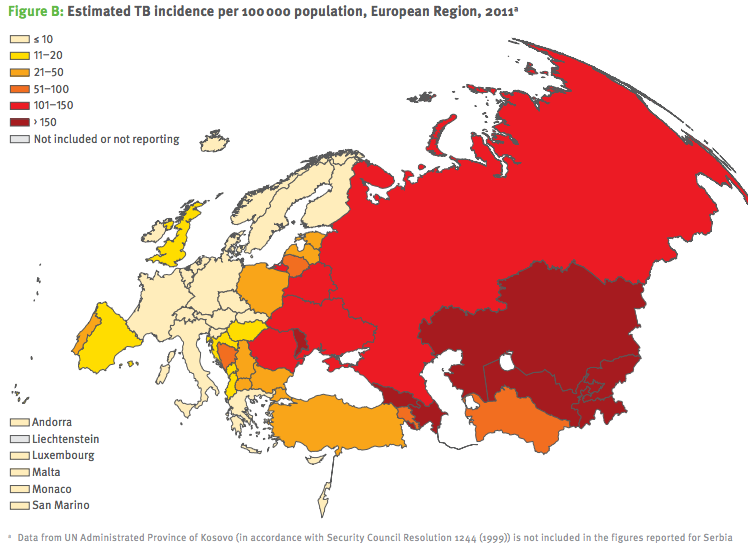 Incidences of MDR-TB and XDR-TB in Europe are the highest in the world, and do not only present a problem to the countries mostly affected (se figure) but in a globalized world with lots of mobility also a growing problem in the rest of the region. And as the name implies, treating (and thus controlling) the disease is becoming increasingly difficult as our current range of medicine is no longer proving effective. So why bring up this issue on a blog focused on Public Health Science Communication? The answer is simple: Because it is a good example of the complexity and challenges of communicating public health science to divers audiences. Next week I will as mentioned earlier be giving a short lecture on public health risk communication to a group of public health students at University of Copenhagen, and I have been asked to try to integrate some ‘practical experiences’ with risk communication. My plan is to use tuberculosis as an example. Unfortunately, I can’t bring many solutions to the challenges, but my aim is to draw attention to some real life, practical obstacles to convert scientific public health knowledge to action. The big challenge: Reaching decision makers! In my assignments for WHO I have not worked specifically with risk communication, but having attended several meetings and contributed to a number of WHO reports I have gained an insight into the many challenges in TB control, the people involved and been struck by TB experts’ difficulties in communicating what science deems necessary to control the disease, including the risks of not acting or acting incorrectly, to the people responsible for making key decisions and allocating resources to it. As with any other disease the findings and outcomes of TB-related research has to reach many different audiences: TB-patients, relatives of TB-patients, the general public, the media, health care workers, nurses, medical doctors, laboratory technicians, health care planners, policy makers, politicians etc. What is necessary and relevant to communicate differs of course depending on who you are trying to reach and the mechanisms to reach them are naturally also different. I will in this blog post not reflect too much on communicating risks to patients and relatives to TB patients nor the general public, but draw attention to the challenges which TB experts face in communicating scientific findings, risks and arguments to public health decision-makers – ranging from senior doctors, hospital managers to politicians. This is an area I feel is often overlooked when talking about public health science and risk communication and definitely a challenge for TB-control in Europe. There are many books, courses, guidelines etc. on how to reach individuals and the general public, but it is at least my impression that literature and discussion on how to reach decision-makers is much more limited or at least difficult to find. Laboratory and biomolecular specialists know what is needed in terms of laboratory tests, which are the most efficient (also in term of costs) and how for example testing TB strains for their susceptibility to different drugs is essential in controlling TB and the risks that arise from not doing so. They know what resources are needed in terms of staff, training and maintenance of equipment. Their problem: Explaining the highly complicated (even to me) techniques, their use of very technical language and abbreviations, their lack of communication training in general and risk communication specifically, their lack of direct access to communicate to and with decision makers. The result: under-prioritization of the laboratory needs in TB programmes and/or half solutions without proper maintenance of machines, continued training of staff etc. All contributing to increased risk of spreading TB – especially X/MDR-TB. Researchers in TB, Heads of national TB programmes, international advisory organisations etc. know and have evidence for the importance of moving towards out-patient care of TB patients rather than relying on placing them in hospitals for the duration of their treatment (which can be move than 12 months). Not only for the sake of the individual patient but also for the public in general. Their problem: Communicating this knowledge convincingly to policy-makers and senior doctors is difficult in an Eastern European context where the old ways of the Soviet times, where hospital treatment was the preferred option, are still present. There seems to be a lack of opportunities or ideas on how to communicate with decision-makers and a fear that advocating for fewer hospital beds and more outpatient care will only lead to fewer resources for TB. In addition, they are in many countries up against stigma towards TB patients and the fact that TB often affects people with low social status (migrants and prisoners) and therefore not very attractive for politicians to spend time on. Form how I see it the experts lacks skills in communicating their knowledge effectively, partly due to lack of understanding of the incentives of decision-makers to go into this area. The result: Reluctance to speak up. Non-effective communication and status-quo for TB-patients’ treatment and care which again only risks to fuel the epidemic. The above examples are just a few of the communication related problems I have encountered and they may to some extend be specific to the European Region. The trouble is that they are in my experience actually often not articulated as communication problems, but rather as problems of securing funding, getting political support, engaging civil society, old-fashioned doctors etc. But from my perspective a lot of this really has to do with a lack of ability to communicate public health research, including public health risks to decision-makers. So how do we deal with this? Well first of all, I guess it is a matter of acknowledging that communication is essential to convert scientific knowledge to actual action – also in TB control. It’s difficult to pursued decision-makers of the importance of paying attention to the TB situation and react accordingly, but there is a need to look into how it can be improved. Improved science and risk communication does in no way solve the problem on its own, but I do believe that a better understanding of how TB risks can be communicated, and an understanding of the position and incentives of the audiences (in this case decision-makers) can contribute a great deal. The experts need to been given some training and insights into science communication, so that can contribute to the discussions themselves – it is not enough to just hire a bunch of communication people to take care of it. Science communication theories and research have a lot to offer. The link just has to made and prioritized already from future experts enter into the academic training in universities etc. Does the technical staff at the World Health Organization (WHO) tweet? Having worked for the organisation on several occasions, WHO is in my opinion not always living up to their foremost authority status. And when it comes to exploring the use of social media in public health they have definitely not been front-runners but rather seriously been lacking behind. All though WHO has applauded their own use of social media (eg. in the Bulletin of the World Health Organization), I believe that they until recently have taken their mouth a little full when doing so. As I mentioned in my blog post A very non-social media article about the World Health Organization, public health and social media, social media was definitely not a part of my world as a WHO professional staff member. It was never encouraged used or explored. And even though the organisation is now a frequent tweeter on @WHO and have profiles on both Facebook and YouTube, I still miss more integration of social media in WHO’s work and traditional communication channels like Bulletin of the World Health Organization. But most importantly I miss seeing them integrate social media into their technical work, research and research communication. But changes might be happening, and even slow starters can get going. I was therefore happy to read the blog post WHO Finds Social Media Indispensable in Managing Global Health Crises by David J Olsen. David Olsen have visited WHO’s Strategic Health Operations Centre (SHOC) and talked to Christine Feig, WHO’s head of communications and Sari Setiogi, a WHO social media officer, about the organisation’s use of social media. Christine Feig describes how social media has fundamentally changed WHO health surveillance and gives examples from the response to the Japanese tsunami and Fukushima radiation crisis of 2011. Social media officer Sari Setiogi (on of two social media officers in the entire organisation) even acknowledges that WHO have perhaps not been among the fastest to adopt social media, but that they during the H1N1 (swine flu) pandemic of 2009 “learned their lesson the hard way” by totally ignoring social media. And according to Sai Setiogi, social media is likely to become a bigger and bigger component in WHO’s work. Where is the technical staff? So WHO has taken on social media. They (or at least their communication department) are actively communicating to and with the public and they are analyzing and identifying trends on Twitter and Facebook with relevance for public health (eg. the fast spreading misconceptions of intake of iodine during the Fukushima radiation crisis). Is the use of social media in WHO something confined to the communication department? Is it only used for the management of global health crises, or does it go beyond catastrophes? Is social media a tool used by for example the department of Non-communicable diseases when doing research or providing technical guidance and support? Does the professional staff of Roll Back Malaria (WHO’s malaria programme) blog about their work? Is the director of Health System Financing on Twitter? Does the mental health department staff participate in Twitter discussions? In his tweet, Matthew Greenall, an advisor on AIDS & sexual health programmes in low-income countries, links to an article published in the Rwanda paper The New Times. The article, authored by Dr Agnes Binagwaho, Rwandan Minister of Health directs a well argued critic against the up-to-dateness of WHO country specific health data. Finding the article very interesting I emailed it to a group of former WHO/HMN colleagues (none of them are on Twitter so I couldn’t tweet it to them). In sending it, I did not really reflect on the possibility that those of my colleagues still within WHO could do anything about it. I just felt like sharing it with them. One of my former colleagues, who is actually involved in health statistics from WHO, read it and responded back quickly thanking me for pointing it out, and said that she had forwarded it up the system to the people who actually are responsible for the World Health statistics and Global Health Observatory. She hoped that a dialogue could be started. I assume she primarily refered to a dialogue with Rwanda, but most definitely also a dialogue within WHO on the measures the organisation has to make sure their data evidence is up to date (which seems to be complicated by WHO itself). I hope, however, that the dialogue could also be on WHO communication strategies and presence on social media, for example to role of Twitter in communicating and keeping up to date on current trends and affairs – not just through one official WHO account, but also through personal or much more issue specific WHO areas. The article by the Rwandan Minister of Health was published in what I assume to be a rather low-impact media channel (how many of you knew of Rwandan The New Times?). All though the story could be picked up by other media and passed on, I am not sure how quickly the story would reach WHO. Of course the WHO country office in Rwanda could pick up on the article and pass it on, but I would be surprised if they have not already been contacted by the Rwandan Minister of Health in relation to the outdated WHO data. It seems however in this particular case that the story travelled the fastest through Twitter, and through Twitter came to the knowledge of the right people and not just WHO communication officers (I wonder if it did?). Although I find the critic of WHO’s data interesting it is not so much the specific story that interests me. Whether or not this particular critic will result in changes, dialogue or changed communication priorities, it was for me once again an interesting and educational Twitter experience. It was great to see how something I picked up on Twitter was passed on and landed in hands of the people who needs to know the content of the article. There really is something to that Twitter invention…. A “must read about WHO and social media” it said in one of the tweets I came across on Twitter this morning, linking to an article in the Bulletin of the World Health Organization called “Mixed uptake of social media among public health specialists“. And true, it was a must-read for me: 1) I have a degree in Public Health Sciences, 2) I am a former WHO technical officer and 3) my main area of work right now is social media and public health science communication. I have actu ally been looking for some WHO thoughts, reactions, comments on the role of social media in public health and to see WHO make use of it. So it is positive to find this article which brings up some interesting perspectives on social media, and adds some words on WHO’s presence on Facebook, Twitter etc. Having read the article I am a little bit disappointed. It is in my opinion a little bit overly positive when it comes to describing WHO’s engagement in and use of social media (which is perhaps to be expected as it is written by WHO itself). As a former WHO staff member, I did not once during my time with WHO come across any encouragement to use social media. No one told me of the official twitter channel @WHOnews or tought me the value of using social media platforms in meetings, conferences or in linking with large groups of people with common interests. We didn’t use it in any of the small meetings or even larger global forums which I participated in organising. I know of extremely few WHO colleagues who are on for example Twitter, and I feel that I’m meet with a good bunch of scepticism when I try to advocate for looking into how social media could bring some added value to both WHO’s work but also its research. Perhaps it is changing but my impression of WHOs involvement in social media does not quite mirror what I read in this article. The article, which by the way as all other WHO Bulletin articles have no comments function or provides active links, tries to give an overview of WHOs presence on and use of Twitter, Facebook and YouTube. Despite some mention of the strengths of social media in interacting with people and its two-way nature, my main impression after reading the article, is that to WHO social media is primarily about disseminating health information and counter rumours which can then be corrected. There is nothing wrong with that. Different kinds of social media are an extremely relevant places to disseminate information, identify rumours and emerging health problems etc. But what about entering into dialogue? Why is there no comments function of WHO Bulletin articles? Where is WHO’s blog? Does Director General, Margret Chan share her thoughts and interact with ordinary citizens anywhere? Can I enter into communication via social media with WHO staff working in the same area as me? The article in the Bulletin does raise the question whether public health should be making more use of social media? And I assume this is also a question as to whether WHO should make more use of social media. I would say yes! Both because whether we like it or not lots with relevance for health is already happening out there and it is essential that WHO is present too. And not only WHO should be there. Also for internal purposes would I argue that WHO’s use of social media would be useful. WHO financial situation is far from perfect and there a cuts being made everywhere. In staff, in travel, in meeting attendance. Here a thing such as Twitter could actually be an alternative to attending a meeting in real life. Following conferences from the sideline is perhaps not as good as being there in person, but it is a good alternative. Live tweeting by WHO from conferences and meetings would also be useful. Actually, WHO regional office for the Americas, PAHO did make an effort on this at the NCD (non-communicable diseases) UN summit in New York in September this year, through their Twitter account @NDCs_PAHO. But lots more could be done. To quote the article “For activists, social media can be an inexpensive and quick platform for their campaigns.” Why should that platform be exclusive to activists? Can cheap and quick platforms not also be useful to organisations like WHO, national health authoritise etc? In the US the CDC has caught on to social media, so I guess it just for others to get started. I wonder when the Danish National Board of Health (Sundhedsstyrelsen) will get their first Twitter channel and even a page on Facebook, which to my knowledge does not exist, despite the fact that more than 2.4 million danes (of a total population of 5.3 million) are on Facebook (according to 2009 figures from Danske Interaktive Medier (FDIM). There are lots of potential out there for several organisations, institutions, universities to explore their role in social media when it comes to public health. All in all its great to see WHO taking up social media and public health and I hope that will help facilitate a useful discussion and further exploring into how these two worlds can interlink and make use of each other. I recommend reading the article which also has great references to blogs on public health matters and other references to other social media initiatives in the field. However, without linking to any of the blogs, Facebook pages etc. and without the ability to comment on the article – which unfortunately makes it a very non-social-media like and instead very WHO-like.